Being a responsible devloper (sic) I like to add unit and instrumentation tests when I add or change code. For reasons Mockito disappeared from my Android instrumentation tests this morning. My project is set up as a library module and an application module that uses the library. Read on to find out how to fix issues like this. To cut a long story short, this happened when I changed the build variant of the application module to release, as shown below. There are a lot of issues tagged with androidTest on Google’s tracker. They are aware of the issue and a fix will come but let’s work around it now. Yes, I know it seems wrong but it at least it works! 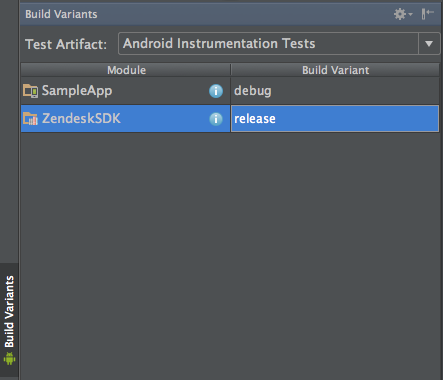 Posted in Android, Annoyances, Development.Tagged androidTest, gradle, provided.